An X-ray showing a normal hip and a hip with Osteonecrosis in a individual on steroids. What are the Signs and Symptoms of Osteonecrosis of the Hip? How is Osteonecrosis of the Hip Diagnosed? What are the possible Complications of Osteonecrosis of the Hip? How is Osteonecrosis of the Hip Treated? How can Osteonecrosis of the Hip be Prevented? Osteoarthritis of the hip is a gradual progressive degenerative disorder that affects one or more joints of the hip. Individuals, who develop the condition, begin to experience pain and stiffness within the hip that usually increase with age. Amanatullah, D. F., Strauss, E. J., & Di Cesare, P. E. (2011). 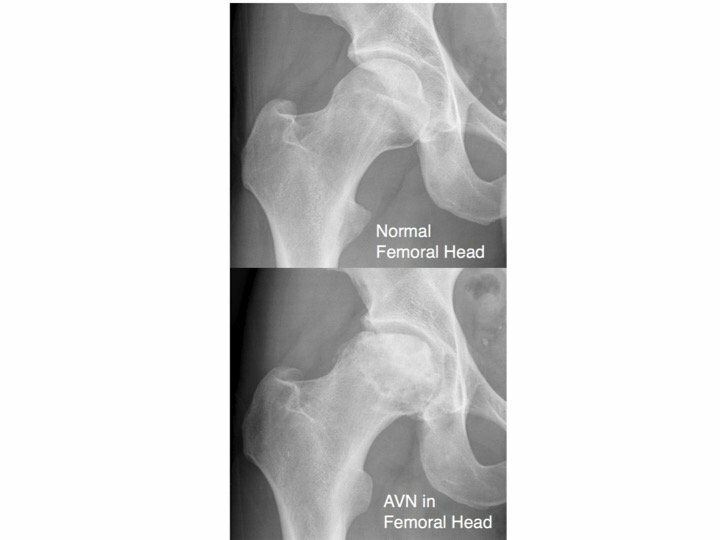 Current management options for osteonecrosis of the femoral head: part 1, diagnosis and nonoperative management. Am J Orthop (Belle Mead NJ), 40(9), E186-192. Lieberman, J. R., Berry, D. J., Mont, M. A., Aaron, R. K., Callaghan, J. J., Rajadhyaksha, A. D., & Urbaniak, J. R. (2003). Osteonecrosis of the hip: management in the 21st century. Instructional course lectures, 52, 337-355. Mont, M. A., Carbone, J. J., & Fairbank, A. C. (1996). Core decompression versus nonoperative management for osteonecrosis of the hip. Clinical orthopaedics and related research, 324, 169-178. Glueck, C. J., Freiberg, R. A., Sieve, L., & Wang, P. (2005). Enoxaparin prevents progression of stages I and II osteonecrosis of the hip. Clinical orthopaedics and related research, 435, 164-170. Hall, F. M. (2016). Osteonecrosis of the Hip?. Journal of the American College of Radiology, 13(7), 762. Hernigou, P., Poignard, A., Zilber, S., & Rouard, H. (2009). Cell therapy of hip osteonecrosis with autologous bone marrow grafting. Indian journal of orthopaedics, 43(1), 40. Israelite, C. L., & Garino, J. P. (2005, March). Osteonecrosis of the hip. In Seminars in Arthroplasty (Vol. 16, No. 1, pp. 27-32). Elsevier. Pivec, R., Kapadia, B. H., Khanuja, H. S., & Mont, M. A. (2013). Osteonecrosis of the Hip. Volume 44, Issue 4, An Issue of Orthopedic Clinics, E-Book, 44(4), 463. Amstutz, H., Le Duff, M., & Boitano, P. (2008). Osteonecrosis of the hip. Hip Resurfacing: Principles, Indications, Technique and Results. Philadelphia, PA: Elsevier, 161-180.